Public transportation is a cornerstone of community vitality, sustainability, and environmental stewardship. We uphold these qualities through our commitment to sustainable practices, leadership principles, and accessibility. Sustainability is integral in our daily practices and long-term objectives to meet the transportation needs of the community we serve. Sustainability is the ability to adapt, grow, and thrive from generation to generation. It is an ongoing effort toward improvement. Sustainable practices must preserve and restore environmental systems as well as promote initiatives that support robust economies and vibrant communities. Sustainable practices must make good business, public, and environmental sense by balancing the community's economic, social and environmental needs. Sustainability must consider people, planet, and prosperity. Maintaining an ISO Certified Environmental & Sustainability Management System (ESMS). Sustainability Metrics: See how we are doing in our annual report. We use an Environmental and Sustainability Management System (ESMS) to help us measure performance. ESMS is a set of management processes and procedures that allows us to prioritize, track, measure, and improve their environmental goals and objectives. In 2018, we will focus on four primary goals: (1) vehicle performance and fuel use; (2) underground storage tank replacement; (3) new underground storage tank operations; and (4) responding, reporting & tracking off-site spills. We achieved ISO 14001 certification in 2014, and ISO 14001:2015 certification in 2016. We are one of only two U.S. transit systems to earn this prestigious certification, achieving a high international standard of environmental management and resource conservation. The scope of Intercity Transit’s Environmental and Sustainability Management System includes the activities, products, and services at the Pattison Street Administration & Operations facility, including our vehicle fleet operating within our Public Transportation Benefit Area. We were a founding signatory to the American Public Transportation Association (APTA) Sustainability Commitment. As a signatory to the APTA commitment, we commit to putting core process in place that set the basis for environmental, social, and economic sustainability practices. We administer these practices on an ongoing basis and continually improve them over time. 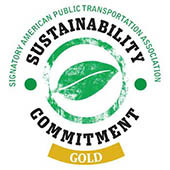 In 2012, APTA awarded us and Sound Transit the nation's first "Gold" signatory status level for their individual for our individual agency commitments to sustainability. Thurston Chamber Green Business program awarded us top honors for our business practices in 2012 and 2014. We received green business designation each year since the program began in 2007. In 2013 the League of American Bicyclists recognized us as one of the first transit systems in the U.S. designated as a Bicycle Friendly Business. We began operating hybrid biodiesel-electric buses in 2010. Currently 33 percent of our fleet is hybrid biodiesel-electric. We were among the first transit systems in the nation to fuel its entire bus fleet with biodiesel. We have used biodiesel since 2002. We currently use a blend of 5 percent biodiesel and 95 percent ultra-low sulfur diesel. Learn more about biodiesel benefits and considerations. Our biodiesel is vegetable-oil based, renewably resourced, less polluting, and biodegradable. This summer we will have 12 new Dial-A-Lift vans fueled by propane. Compared with vehicles fueled by conventional diesel and gasoline, propane vehicles can produce lower amounts of some harmful air pollutants and greenhouse gases. Learn more about propane benefits and considerations.